In the spring there are more than a few people turning their attention to their weight. Some have just a few pounds to lose, some have a few more. I fall into the category that comes after that few more. 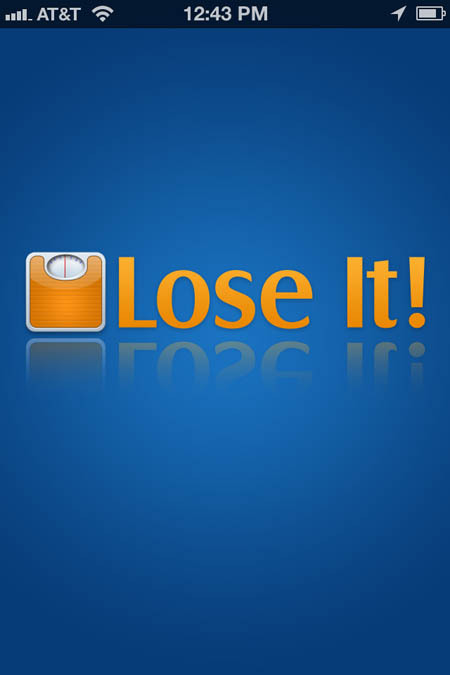 Lose It is packed with tools. Once you set your goals, you keep track of everything you eat or drink and all of your exercise. Finding food choices is not difficult. It features a database of foods with calorie, fat, carbohydrate and protein content information. 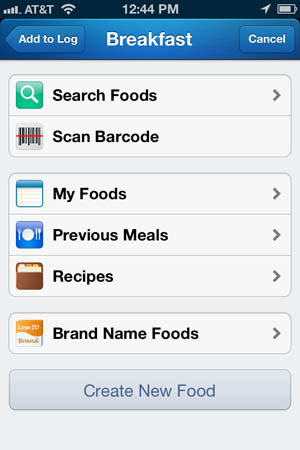 If what you’re eating isn’t in the database and you have the package, the app has a bar code scanner. If you scan the code, the calories, fat, carbohydrates and protein come in automatically. Here you can see the different ways to search for food. Many normal items are found in the “Search Foods” area, and if the bar code is not available, you can enter your own foods. Foods that you’ve entered yourself are found in “My Foods.” They are entered with the bottom button titled “Create New Food.” You can find nutritional information for most foods online with a search engine. It is important to enter not only the calorie count, but fat, carbohydrate and protein in grams so you can track whether you’re getting enough of each. The button “Previous Meals” lets you pick a meal from another day and “Recipes” lets you add your own recipes. You can enter the recipe for the total number of servings, which is the way we cook, then go back and enter your serving when you consume it. No cheating. If you eat a serving and a half, count it. This is like golf. You can only cheat yourself. “Brand Name Foods” lists both menu items from restaurants and supermarket foods. To the left you can see a daily tracking screen. 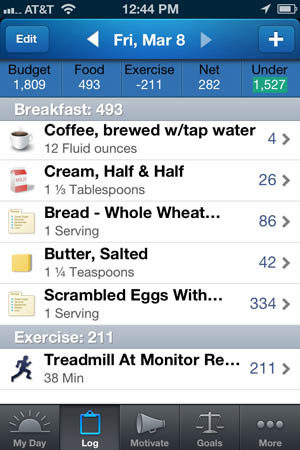 Each item consumed for the day will show up on that screen along with any exercise. Budgeted calories show up on the top left, any food next. Exercise is then subtracted for your net calorie count for the day. Calories remaining are at the upper right. It’s very simple to use. There is an exercise database that gives average calorie burns for several activities. Listed along with regular sport activities are housework, yard work and gardening. Since there are so many different kinds of yard work, that button takes you to another screen to choose the exact activity, whether it’s cutting wood, stacking wood, raking leaves, etc. 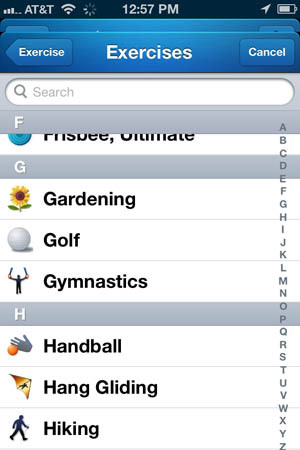 Here you can see the exercise search, with two of the activities that people consider rather fun, golf and gardening. Touching any of those items takes you to another screen that shows the average calorie burn for each. You enter how long you did it. I don’t know about you, but I’d much rather spend a couple of hours playing golf than spend thirty minutes on a treadmill. The app says one hour of golf burns over 400 calories. I bet I burn a few more since I get to hit the ball so much more than most players. Gardening is another activity many of us do without thinking about it. 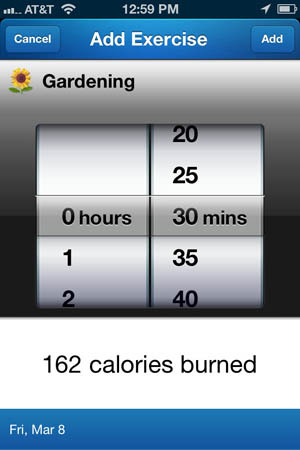 Thirty minutes of gardening burns 162 calories! I wear a heart monitor when I exercise because I really want to get closer than average for the calorie burn, and because I’m not a spring chicken any more. I want to work the weight off and improve my breathing, not call 911. If you’re like minded, there is an area to enter custom exercises. 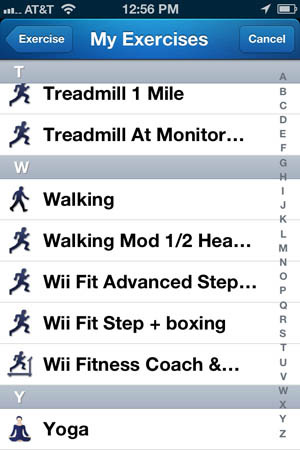 You enter the name of the activity, the time and the calorie burn from your monitor. If you choose “motivation” (very bottom of the screen on every view) you can set up friends who are also using Lose It. It’s a great app. I started a week and a half ago and I’ve lost 4.4 lbs. My goal is a pound a week, and I wasn’t trying to do it faster. I’ll take it, though. Give it a try. I find it really easy to use, and the phone application is always with me to keep me honest.